This season we’ve had more rain with spotty periods of sunshine than sunny days. The moisture and mud have a definite impact on how much time I spend in the garden. It's probably just as well. The holidays are a time of gatherings with family and friends, shopping and shipping. It's also the time of year that business becomes frantic so the fewer distractions I have, the better. So, where do I find myself when the holiday madness has settled? You guessed it, in the kitchen. Like growing food for my family, preparing a meal is a gift that I can present on a daily basis. Some days, meals are quite simple. On others, they are more involved. But my rule in the kitchen is that nothing should ever be complicated. Menu... Plan the menu. Consider each individual who will be at the dinner table. Vegetarian? A known food allergy? Be sure to have something for everyone. I often create the basic menu and then round it out with items for those with special dietary needs. Gather recipes... I like to print a copy of each recipe so I can have it on the counter or at the stove without worrying about spilling anything on it. Spilling is part of my process. Shopping lists... I go through each recipe making a master list of every single ingredient I will need. If there's something that I think I have in the pantry, I physically make sure that I have plenty on hand before removing it from the list. The lists need to be really specific. Include quantities and brands if it makes a difference. Make a note of any items that you have a coupon for. Then I break it down into smaller lists. I'd like to think I can do all of my shopping at one market but that's just not the case. The store for my staples just doesn't offer the selection or quality of fruits and vegetables that I want. Speaking of vegetables, one of the lists always includes those things that I need to go out and harvest from the garden. To recap, there will be one list for each store along with one for the garden. Timing chart...Work backwards...what time do I want to serve each dish? Now I review each recipe to determine how much prep time is involved. With this list I write down when the actual cooking time begins. Then I can determine the precise time that I need to begin preparation of each dish. Master timing chart... This is a bit like putting together a puzzle. Reviewing all of the cooking and prep times involved I can now make one master cooking list showing the precise order that I need to get things done. I suggest that you build in some time to get yourself ready into this chart! Serving pieces...Exactly what serving pieces will I need? I get them out and find a safe place, out of the way for them to remain until I'm ready to use them. On each piece should be a small piece of paper. Write what food will go on each piece of paper. Sound like a lot? Trust me, the up front organization will help to keep you on track and stress free when you're actually in the kitchen. That's it! Follow these steps and you're ready to do the shopping. By the way, if it's at all possible, I delegate some of the shopping to family members. I warn you, however, no matter how detailed the lists are, you will receive many phone calls from the market. It's worth it, though! You can get a lot done while someone is doing your marketing. And your back will thank you for it. So, be brave...go on and plan a dinner party! Please allow me to get something off my chest...Winter vegetables will never appeal to me the way that tomatoes do! There, I've said it! I'm not going to try to fake that I'm a happy gardener any more! When I walk out to the vegetable garden I want to feel the warm sun beating down on my head. I want to walk barefoot in the soil that's so soft it feels like I'm walking on clouds. I want to walk amongst the tomato plants selecting a cherry variety here and something larger there. I don't need to rinse or even carry them inside to enjoy a filling garden snack. With Fall comes a very different garden reality. My morning stroll now involves bundling up with wool socks and a jacket. The ground is cold and moist and in some areas it's mud. The few remaining cherry tomatoes are cold. I cannot detect even the slightest hint of warm sunshine when I eat them. As I walk from one bed to the next I see that I have more space for additional planting. I don't have anything pressing that I absolutely "must" plant. I'll think of something just so the space isn't wasted. Continuing on I notice that the peas are getting quite tall. 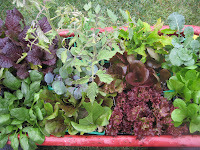 The lettuces all should be harvested. 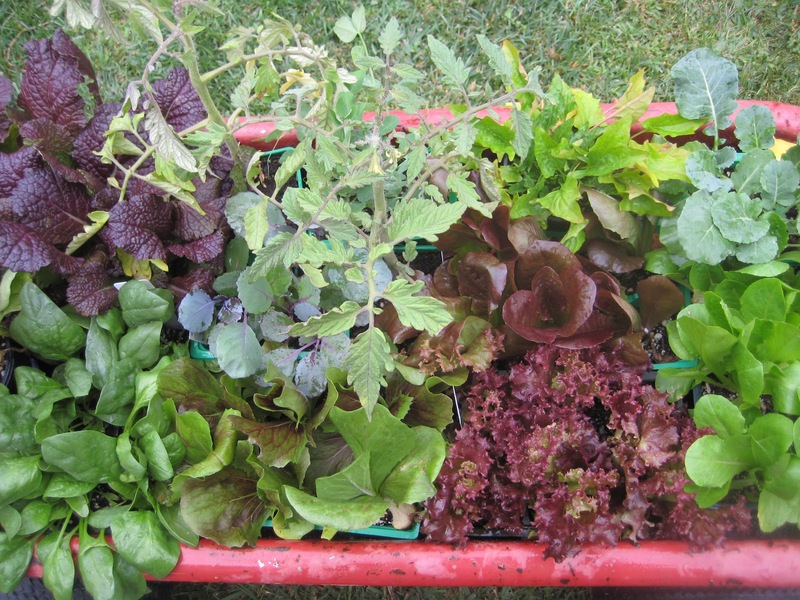 There's plenty ready for fresh salads. Some have smooth spotted leaves, some have spiky leaves, some have curly berry red leaves and some almost lime green. The spinach is lush and full as is my favorite, arugula. In the next bed broccoli, cabbage and cauliflower continue to grow. I am amazed to see the many shades of green that color my gardens. Blue greens, gray greens, yellow greens and brown greens all coexist to create an incredible palette of color. Beets, with their red and green leaves stand upright and reach up to the sun. Bright Lights Swiss chard seems to double in size every week and doesn't disappoint with it's dark green leaves and fluorescent yellow, red and orange stems. Some people would never believe that these are true colors of the garden. It's something that only a gardener has the privilege to know. Heading back toward the house I notice a little pang of hunger and reach down to take outer leaves from some of the lettuces. There in my hand I enjoy a fresh picked salad of mixed greens and find that my hunger has abated. I smile to myself and think that maybe I do like growing winter vegetables after all. When I began gardening many years ago it was just something I thought my young sons and I would enjoy doing together. It was about the process, digging in the dirt and weeding and watching something grow. As the years went by, working in the garden was something I could do to pass the time while the kids were playing in the yard or in the pool. I was able to keep a watchful eye without hovering. I don't remember many details about those early days in the garden. I'm not sure how much we really harvested but I can vividly recall the wonder and excitement in watching a tiny seed or small plant become food for my family. The experience fascinated me. Each Spring, the garden grew both in size and in numbers of plants for no other reason than that I enjoyed the act of gardening. As my fascination with heirloom tomatoes grew I found myself attending classes and reading about things like healthy soil, organic fertilizers and worm tea and researching tomato varieties – their distinct characteristics and habits in growth. Without purpose or intent, a farmer I became. It is still the process that drives me to spend countless hours in the vegetable garden. But, it is the product that grows from passion for the quality of flavor, color and texture and the knowledge that I know exactly what I am feeding my family that is the real reward. Last weekend I had the opportunity to spend a few hours sampling little bites of about 30 tomato varieties. This is something I do rather often here in my garden but it was special this day for two reasons. The tomato tasting was hosted by a man known as the tomato king. To me, he's Steve. Steve has been giving growing classes for as long as I have been growing and I've been fortunate to be the recipient of his knowledge and understanding of how tomatoes grow. Earlier this year, he and I discussed the pros and cons of hydroponic tomato growing. He had been asked to do some trials using a hydroponic set-up and asked for opinions, so I gave mine. To me, growing tomatoes is almost as much about the act of doing as it is about the fruits of my labor. I have spent years learning how to improve my soil so that it can feed and support my plants while I am feeding and supporting it. Using a hydroponic gizmo just seemed to defeat the whole purpose. Steve decided to give the thing a try and he promised to keep me apprised of plant growth and production throughout the season. At the tomato tasting I was able to sample the fruit picked from the plant grown in water. When I arrived I was honored that Steve came to me and said "Come here, I need your expertise." Wow - that was a compliment I never expected to hear! He took me over to a pretty red tomato, all cut up and ready for sampling and told me to take a bite. I was taught to be polite so when I took a bite and said "that's awful" it was quite a surprise. But it was. Then he gave me a bite of another red tomato. He told me both tomatoes were Early Girl. The second bite was full of earthy flavor and tasted like a tomato should! One was grown in the ground in Steve's backyard and the other was the hydroponic experiment. You know, of course, which was which. The moral of the story?? Tasty tomatoes are grown in healthy soil and not in water - remember, I always tell you not to overwater! This is proof! Before I left I approached Steve and said, "Now I need some of your expertise." I pulled the mystery tomato out of my bag and held it up for him to see. Within a nano second he simply said "Green Pineapple". That's why he's the Tomato King. Thanks, Steve. Every year I end up with a mystery tomato in my garden. I'm not referring to the volunteers that pop up here and there thanks to squirrels depositing seeds wherever they fancy. I'm talking about one of the very carefully selected varieties of heirloom tomatoes that I absolutely must have in my garden that season. When I buy seedlings it is with purpose and intent. I take along a list of what I know I want to grow. I read the labels and descriptions of every variety before making selections. I create a chart so I can keep track of how many of each size or color I am putting in. So, how do I always end up arriving back at home with one plant that I cannot identify? It's like losing a sock somewhere between the washer and the dryer - it's just something that happens without explanation! This year's mystery plant was stuck in a small space in between the artichokes. I wasn't sure it would get enough sun but thought to myself "I don't even know what it is, so a sub-prime location in the garden will be just fine". This plant got off to a slow start. I labelled it "Persimmon ???" because I seemed to recall buying an extra Persimmon after they were such a huge hit last year. When the sun finally appeared the mystery plant became very happy and it now stands 8 feet tall! It is lush and green in spite of the triple degree temperatures we're having - quite different, by the way, from the other persimmons growing in the yard. It produced several fairly large roundish fruit at the bottom. They cracked and rotted before becoming ripe. Toward the top of the plant there are many more large, green fruit waiting to mature in color. Just about at eye level there was one huge triple lobed tomato just waiting to ripen. It's shape was quite different from the others but the color was just the same...medium, soft green with subtle striping from the shoulders in darker green. If I looked very closely I could see just a hint of blush trying to come through. If tomatoes had a "finish" I would have called this matte as opposed to Green Zebra which is more of a semi-gloss. So, I waited and waited for the color to change, thinking it would soon become one of my bi-colored favorites. But as the August temperatures rose I was afraid to leave it on the plant to ripen. In 105 degrees it could have cooked out there. I thought I would bring it inside to ripen on the counter top but when I took it in my hand I realized it felt perfectly ripe. I was shocked as it was still green. There, on my kitchen counter sat a 1 1/2 pound green tomato that begged to be eaten except for the fact that I wasn't sure if it really was ripe. I waited a day and nothing changed. In my house we make an event out of sampling new varieties and comparing them for flavor and texture. Tomato taste tests have become a tradition. So, we cut in. It was slick and juicy on the inside. Sure enough, the meat inside showed those same hints of blush coloring. Not knowing what to expect I took the first taste, making sure it was safe for the others to eat. All they had to do was to look at my face...It was incredible with a true tomato taste, just slightly sweet to cut the acid and a tiny tingle on the tongue just to remind you that you're eating a tomato. I don't know what that variety was called and I was so excited that I made sure we ate every last bite of my delicious mystery, completely forgetting to save some seeds. Maybe someone will be able to identify it or maybe it will just have to be known as 'One Hit Wonder". Here we are…it’s the beginning of July and people everywhere are preparing to celebrate the country’s birthday with fireworks and festivities. For some, though, the celebration has much more of a personal significance. This is not to downplay the importance and magnitude of the festivities honoring our freedom as a nation, it’s just that to the tomato grower, this is the time of year we’ve all been waiting for. July can’t come soon enough. Patiently we waited for the days when the soil in our gardens was warm enough for planting. We carefully placed our tomato seedlings in the ground and nurtured them so they would grow tall and full and alive with flowers. Bright yellow flowers evolved into tiny green orbs and we’ve watched and waited as they’ve grown and matured into full size, beautifully colored, full-flavored love apples. As we rejoice in the harvest of our tomato beauties we have to remember that the plants, themselves, still require our love and attention. As temperatures rise and the summer sun takes its’ toll, tomato growers need to reach into their basic knowledge of tomato plants to assure a successful season and continued harvest. First and foremost, as tempting as it may be, don’t overwater your plants! A good rule to follow (and that which I follow with my 100+ plants) is this: take your cues from the plants. Check them in the morning. If they appear droopy before 10 am they need water. If you wait to check on them in the late afternoon when you return home from work, you will cause yourself to have heart failure. That’s really not the point of gardening, is it? Most of us are droopy late in the afternoon on hot summer days. But as the evening cools so do we and while we may have been droopy we get our second wind. The same is true with tomato plants. You may want to consider gently draping a sheet of shadecloth over the tomato cages to give the plants and ripening fruit a break from the scalding sun. Keep an eye out for garden pests that want to enjoy your plants and fruit almost as much as you do. Holes in leaves tell you that some pest needs to be dealt with. Look at the underside of the chewed leaves. That’s where you’ll often find the culprit. Even worse, leaves completely chewed off are a sign of trouble…the dreaded tomato hornworm. Finding the hornworm on a tomato plant is tricky. They stretch out and camouflage and sometimes look like a curled leaf. When you find one, remove him with your hand or a pair of chopsticks. They wont hurt you and FYI, the horn is not on its’ head. What you do with the hornworm after you’ve removed it is personal choice – just make sure to get it away from your tomatoes! Wondering when is the best time to harvest tomatoes? My preference is in the morning when the plants and fruit aren’t stressed. A slightly water deprived plant you a sweeter tomato so don’t harvest just after watering. The best time…24 – 48 hours after watering. Tonight was the first taste test of the season - the first of many, I'm sure. Tomatoes are just starting to ripen. Most of the larger varieties need a little more time so the tomatoes I tasted today were Black Plum, Sungold Cherry, Gold Nugget, Cherry Pink and Green Zebra. I would have liked to include the three beautiful and ripe Woodles Orange in the tasting but a rodent of an undetermined species got to them first. Gold Nugget was a tasty little gem, bright and sweet but maybe not enough. Cherry Pink didn't have enough flavor but I think I tasted a little hint of bubble gum in the after taste. Maybe it was just wishful thinking. Black Plum was strong and tart, a little too much for me. Green Zebra is on it's way to being delicious. This is the first year I'm having success growing Green Zebra. I believe the mild weather has something to do with that. I'm looking forward to enjoying more of them. True to form, one of the few hybrids that I allow myself to grow, the consistently sweet, delicious and prolific Sungold Cherry wins today! My father was a lucky man. He didn’t want much and what he did want was sitting around the dinner table every Sunday night. If my father were here today he wouldn’t want any gifts wrapped up in boxes. He’d have been happy to see me tending my vegetable garden and carrying on about all of my tomatoes. He never quite understood why I collect tomatoes, of all things, but he collected exotic cars, so I guess it’s in the blood. Even if he didn’t get my obsession he clearly knew how much it meant to me. So, when I went on about the colors and shapes, he would crack a little smile, sometimes chuckle and would willingly sample whichever variety I put in front of him. In my backyard, across from one of the original tomato beds lies a small patio area. It’s next to one of the newer garden boxes that becomes a riot of color each spring with bearded irises and then transforms to a growing bed for tomatoes plants and grapevines. It’s just a few floor tiles, a white wrought iron bench, and a dwarf Valencia orange tree. The bench was a Father’s Day gift to Dad many years ago. It graced the front porch at my parent’s home although I don’t think they ever sat on it. It was just something that completed his vision of the porch. I grew up in a house that was in the middle of an orange grove. We squeezed fresh orange juice for my Dad every morning before he made the drive downtown to work. This little patio is framed on two sides by several rosebushes…all with names related to music. As a teenager my Dad was an incredibly gifted violinist and pianist, but young men in the 1930’s had more important things to do than pursue their dreams. Somehow, the rosebushes make me feel that I’m helping to keep his dream alive. Sometimes I’ll go over and sit in this special place in the garden.. There’s a certain black and yellow butterfly that I’m sure hovers right above me because it carries my Father’s spirit. I’ll chat with my Dad as if he’s right there listening to me… It’s where I go to be with him. This place, this thing that I spend so many hours doing, is so much more than just growing tomatoes. Most gardeners who have 100 tomato plants in their gardens also have some type of drip irrigation system. Some are set on timers and some are activated manually. You’ll notice that I said “most gardeners”. I am not one of them. I prefer to hand water each of my plants, a process that can take well over an hour each time I water. I don’t have any scientific reason for this. It’s not that I have some secret to greater tomato success through hand watering. The fact is, watering time is my down time, my “me time”, my don’t you dare bother me time. It’s just me alone with my thoughts holding the hose to give each plant it’s deep soaking. Somehow I think they appreciate the individual attention by getting their own dedicated drink of water. The soil beneath the tomatoes is saturated and as I look up I see two butterflies chasing each other in flight. Lizards scurry through the gardens, squirrels chatter in the trees and there’s an adult hawk flying above, teaching her youngster to fly. For a moment, I am transported back to my sanctuary. How lucky to have such a spot, even if it’s only for a moment. Mid spring is the perfect time in the garden. All the seedlings have grown substantially. Tomato stems need to be gently tied to their stakes. The plants are brightened with scores of little yellow flowers soon to give life to red, orange, yellow, pink and purple orbs. Sweet peas and scarlet runner beans wind their way over and through the trellises, holding on and stretching further every day. Light pink and soft lavender fragrant flowers rise from the Sweet peas. Orange nasturtiums and purple columbine adorn their mounds of foliage ... The hollyhocks are eight feet tall with cupped flowers providing shelter for the sleeping bumble bees. Bearded irises in shades of purple, yellow and pink are every bit as glorious as a Van Gogh painting and the roses are in first bloom boasting huge, fragrant flowers in every color imaginable. This is garden perfection! It was one of those rare moments when the entire family was out in the backyard together. Carefully we surveyed the growth and progress of each plant which just a month ago were small and delicate. Sampling a leaf of sorrel or beet greens we harvested artichokes for dinner. We made our way to "pepper city" - five pepper plants growing in containers and encircled with chicken wire to keep the Basset Hound at a distance. My son, keeper of the peppers got to them first when he shouted "Oh, no! There's a giant grasshopper in my peppers!" He ran for the shears, known as the grasshopper getters in my family and I called for Hucksley, the Basset Hound. Hucksley has discovered that catching grasshoppers is almost as fun as taking large chomps of broccoli leaves and florets as he bounces by. The dog was busy chasing a lizard so the grasshopper getters where put to use. Snap! Got him right in the middle. Of course, we were all chuckling. Except for Andrew, who now was faced with wondering what to do with a grasshopper that he had captured mid body in the garden shears. We yelled "Take it to the trash can and chop it in half" which was more than Andrew could bear. He thought it would be much better to smash it on the back side of a shovel. We knew the armored creature wouldn't be destroyed so easily and sure enough it flew away. We all laughed as my son looked on, shocked that the grasshopper was still quite alive! Alas he had no choice but to grab the shears, recapture the prehistoric flying creature, dangle it over the trash can and snip, with half of the grasshopper still managing to escape. But, determination won out and amidst our laughter, the grasshopper getters, and Andrew did the job! We cheered as one less menacing grasshopper would reside in our garden. This was family life at it's best. After a long afternoon out in the garden I decided to stay in this evening. The original plan was to go out to a movie but getting cleaned up to go out in public would require more energy than I had in reserve. The decision was made to stay in, put together a salad and throw something on the grill for dinner. With potatoes scrubbed and baking in the oven, steaks marinating and ready for the grill I began to assemble the salad. I tore the lettuce just brought in from the garden, sliced fresh mushrooms and cucumbers and quartered two bright orange tomatoes bought earlier in the day at the local grocery store. I have a rule about produce…either I grow it in my backyard or I buy it from the one local grocer whose produce is significantly better than any other market in the area. It’s just April so I don’t really expect the tomatoes to be great. I avoided buying them all winter but today the sight of those bright orange orbs was more than I could resist! The sun was shining, the temperature warm and my imagination ran wild and I was convinced that I was going to enjoy a perfectly delicious tomato…WRONG!! The tomato was soft and mushy inside, the seeds slipped out in their gel and my taste buds wondered why I even bothered eating this at all. For the better part of this afternoon I worked in the garden. Today was the day I planned to plant the tomato seedlings that I had purchased a week or two ago. I selected 60 new varieties to grow this year along with 10 or 20 of my favorites – Pineapple, Neve’s Azorean Red, Sungold Cherry. It took much longer than anticipated to decide where each seedling should go. Some would be planted in the ground, some in raised beds and others in containers. By the time I decided on the layout and began digging the deep holes for each tomato start the sun was lowering behind the hill and the air was getting chilly. As much as I wanted to get them into the ground today I knew that watering late in the afternoon would result in really cold water shocking the delicate roots of the plants later this evening so I chose to dig the holes but to delay planting until tomorrow. Planting tomatoes each year renews my faith in the wonder and possibilities ahead. It raises my spirits. Spring reminds me that we have this great opportunity to begin again. I marvel that with a little care these small seedlings will become large plants that will provide food for my loved ones. The tomatoes are the reward for the hard work. It’s the hard work that feeds my soul. At long last, it's time to amend the soil, buy your seedlings and get the tomato garden planted! For me, that's music to my ears. But to many, getting the Summer garden started is an overwhelming task. Knowing what products to buy and how to use them is foreign to so many people who would just love to grow their own vegetables in their gardens. Sometimes the lack of knowledge can be paralyzing. My goal is to demystify the process so that you can enjoy tomato gardening as much as I do. It's my 2010 Tomato Growing Guide and Calendar. It runs March - February because it begins when tomato season begins! Every month offers concrete information about the things you should be doing in your garden. The non growing months provide other information for the tomato enthusiast. With beautiful photographs, gardening tips and delicious recipes this Tomato Calendar is every tomato lover's dream! Order your copy by sending me an email today! Wishing you an amazing Summer garden! For those of us in Southern California the wait is almost over. In just a matter of weeks our temperatures will be consistently warm and we'll have enough sunlight each day so that we can plant our first tomatoes of the season! 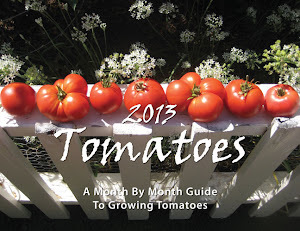 I'm so pleased to present my 2010 Tomato Growing Guide and Monthly Calendar! It begins in March, when our thoughts really turn to tomatoes and continues through February, 2011. Each month offers a spectacular photograph of some of my favorite tomatoes. 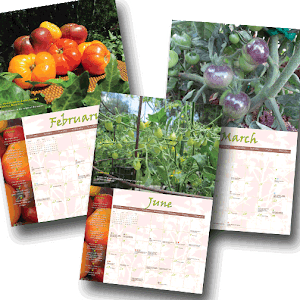 Much more than a calendar, this gardening tool provides tips for growing tomatoes or enjoying them indoors every month of the year. This first run also contains some of my favorite tomato recipes for you to try with your summer harvest. 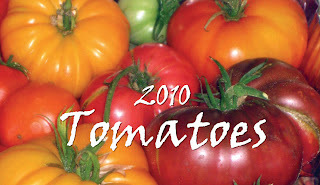 The 2010 Tomato Growing Guide and Calendar will be available the first week of March. The cost is $19.95. Pre order yours now and I'll ship it to you ($4.95 shipping) or you can arrange to pick it up from me. Pre order your 2010 Tomato Calendar today! Wow! Waking up to the sun shining through the windows, I couldn't help but jump out of bed and hurry to the back yard. I realize it's still the middle of winter, but I've really had more than enough rain and cold temperatures. I hate winter. Just last week when rain was pouring in sheets straight down from the sky, I tried to think of warm, sunny days in the garden. I sat on the couch staring out the windows at my water logged, muddy, colorless garden. The roses had been cut back, hydrangeas pruned and the flower borders all pulled out waiting to be replanted with spring annuals. It was not pretty. I looked out beyond the brick wall, and there in the distance, I could see my homemade tomato cages standing empty, all lined up like good little soldiers, as eager as I am for the new tomato season to begin. Those tomato cages, made of wire sheeting, are large and cumbersome and have to spend the winters out in the weather. These are my extras. I also have a sizeable collection of my favorites, the Texas Tomato Cages. They come in various sizes and fold up neatly to be stored when not in use. Absolute Genius...they may be a bit pricey but so worth it. As I said, they fold up and are easy to store from one season to the next. They are strong and sturdy and I expect they will last forever. It occurred to me that although it's raining now and planting time won't arrive for at least another month, there's still plenty I can and should be doing to prepare for spring. All of my cages have lengths of twine crossing them which I use to support branches that don't quite reach the sides. There are name tags on them from last season. I need to wipe all of the cages free of cobwebs that have accumulated and remove the strings and labels. Garden tools all need to be gathered and cleaned so they're ready the moment the weather permits. The garden shed itself, could probably use some organizing. Unused seed packets can be collected and put together. Fertilizers and soil amendments should all be in one place so I don't have to dig to find them when it's time to use them. Decked out in my rainboots and jacket, umbrella in hand, I slogged my way out to the garden shed. With the doors swung open I propped the umbrella on top and created a shelter from the rain. It turned out that even though it wasn't tomato season, in fact it was just the middle of February, I had a lot of gardening to do.